Four people have been taken to hospital in a critical condition after a reported explosion in Leicester, according to the local NHS Trust. Six fire engines were sent to the scene after members of the public reported a large blast in the area at around 7pm. A spokeswoman for Leicestershire Fire and Rescue Service said firefighters were on their way to the scene when police told them a building had collapsed. The building was two-storeys high with a loft conversion and it had suffered a “pancake collapse”, she said. “This is a search and rescue at the moment,” she added, saying that there is “no indication” of the cause. Additional specialist search and rescue teams have been sent to the scene on Hinckley Road, including a search and rescue dog from neighbouring Lincolnshire. Debris was blasted across both carriageways of the road after the blast, which destroyed a house and a convenience store, according to reports. People have been evacuated from businesses and homes nearby and taken to a police station for their safety, police said. I understand there are no early indications that the explosion in Leicester was connected to terrorist activity. Police are investigating. Resident Kat Pattinson told Sky News: “We were just in the house…about 500m from where the blast has taken place. “There was a bang and the whole house shook. “The emergency services were in attendance, there was a lot of smoke, just an awful lot of smoke. She described the building as “a shop with flats on top of it”. At the scene, Sky News Correspondent Tom Parmenter that damage to the main building, a Polish grocery store, had been “very very significant”. He said the store had been “effectively demolished by the force of the explosion”. Local journalist Laura Scigliano told Sky News: “The smoke is so thick you can feel it in your throat. She added: “I spoke to one lady who heard a massive bang. “One man said he thought it sounded like a bomb. She described the road as one of the main routes into the city that was “usually very busy during the day”. Leicestershire Police said: “The cause of the explosion will be the subject of a joint investigation by the police and Leicestershire Fire and Rescue Service. A vote has been delayed several times since Thursday, and was due to meet on Saturday. How bad is the situation in the Eastern Ghouta? On Saturday, the Syrian Observatory said at least 29 civilians were killed, including 17 in the main town, Douma – bringing the total to over 500 for the week. The group said the strikes were being carried out by both Syrian and Russian planes – although Russia denies direct involvement. Barrel bombs and shell fire have been dropped on the area, where some 393,000 people remain trapped. Aid groups report several hospitals being put out of action since Sunday. 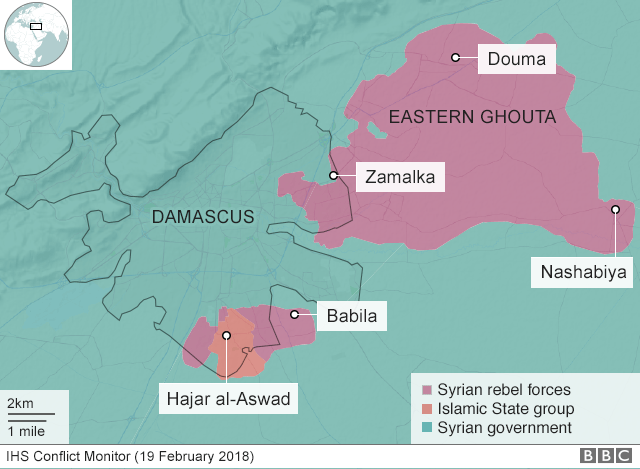 The Syrian government has denied targeting civilians and said it is trying to liberate the Eastern Ghouta from “terrorists” – a term it has used to describe both the jihadist militants and the mainstream rebel groups that hold the enclave. The plight of civilians in the area has alarmed world leaders. Conditions there have been described as “hell on earth” by UN Secretary General Antonio Guterres. Why has a ceasefire proved elusive so far? The Security Council has been debating a resolution calling for a 30-day calm to allow for aid deliveries. But Russia wants changes. Under current draft, any ceasefire would not apply to the Islamic State group, or the Nusra Front – formerly al-Qaeda’s official affiliate in Syria. Moscow says it must go further and exclude other groups “co-operating with them” and which have shelled Damascus. Western diplomats have accused Russia of stalling for time. They suspect that Moscow wants to give Syria time to deal a final blow to forces defending the enclave on the edge of Damascus. On Friday evening US President Donald Trump pointed the finger of blame firmly at Syria and its allies, Russia and Iran, for the humanitarian crisis. The rebels in Eastern Ghouta are not one cohesive group. They encompass multiple factions, including jihadists, and in-fighting between them has led to past loses of ground to the Syrian government. The two biggest groups in the area are Jaish al-Islam and its rival Faylaq al-Rahman. The latter has in the past fought alongside the jihadist group Hayat Tahrir al-Sham – an alliance of factions led by the Nusra Front, which sprung from al-Qaeda. The Syrian government is desperate to regain the territory, because it says the rebels are directly endangering the capital. Eastern Ghouta is so close that it is possible for rebels to fire mortars into the heart of Damascus, which has also led to civilian deaths. Syrian state media said rebels have killed at least 16 civilians in eastern districts of the city since Sunday. Brigitte Bardot has become the latest French celebrity to weigh in on a family dispute over the estate of the late singer Johnny Hallyday. 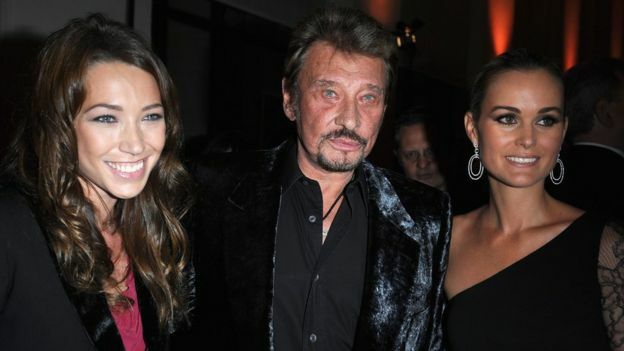 In a radio interview, the movie legend urged Hallyday’s widow Laeticia – named as his main heir – to give some of the money back to his older children. Singer David Hallyday and actress Laura Smet, who were left with nothing, are contesting their father’s will. Johnny Hallyday died in December from lung cancer at the age of 74. Under the country’s inheritance laws, which go back to the French Revolution, all children should be given roughly equal shares of an estate. But Hallyday, who had a home in California and was domiciled there for tax purposes, left everything in his will to Laeticia, his fourth wife, and their two adopted daughters. Laura Smet, 34, and David Hallyday, 51, announced their legal challenge last week. Since then a number of big names in the world of French entertainment have spoken out on the matter. Actor Jean Reno, a friend of both Johnny and Laeticia, urged the family not to yield to “hatred”. Singer Sylvie Vartan, Hallyday’s first wife and David’s mother, said that during their divorce in 1980 she had urged Johnny to give her share of their home to their son. 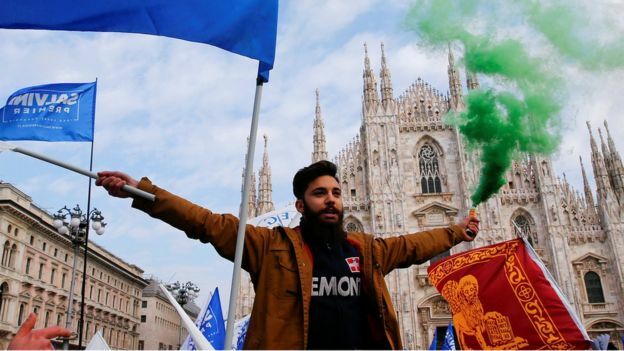 Rival demonstrations by far-right and anti-fascist groups a week before Italy’s general election have led to scuffles with police. Police in Milan used batons as left-wing demonstrators tried to break through a cordon. Elsewhere, the leader of the anti-immigration League party, Matteo Salvini, told supporters that defence of the country was a “sacred duty”. Protests also took place in Rome and the Sicilian city of Palermo. As the election campaign enters its final week, opinion polls suggest that the right-wing Forza Italia party led by former Prime Minister Silvio Berlusconi is in the lead. The anti-establishment Five Star Movement will be vying with Mr Berlusconi’s party for the top spot in the 4 March election. However, it has repeatedly ruled out governing with other parties. Image caption: The far-right League could attempt to form a government with Silvio Berlusconi’s party. The far-right League and the Brothers of Italy parties could attempt to form a right-wing coalition government with Mr Berlusconi but this is unlikely to achieve a parliamentary majority. Clashes between anti-fascist and far-right activists have increased in recent weeks ahead of a general election on 4 March. On Thursday, several police officers were injured in clashes between far-left and far-right protesters in Turin. 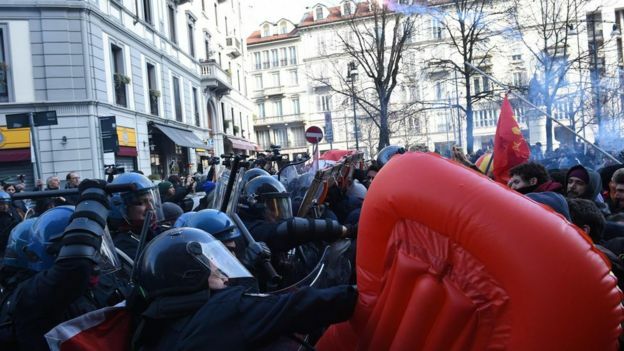 Riot police clashed with protesters at a campaign rally in Pisa on Friday by the League party. On Saturday, anti-fascist demonstrators in Milan protested against the anti-migrant stances of far-right parties. When they tried to break through police lines, officers beat them back with batons. In Rome, some 3,000 officers were deployed for marches and sit-ins on Saturday. Riot police used metal detectors in a series of measures aimed at preventing violence. Several thousand people took to the streets of the capital to protest for democratic values and against what they described as resurgent fascism. 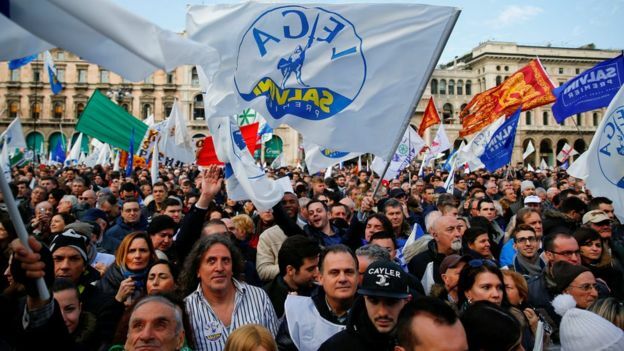 Former Italian Prime Minister Matteo Renzi took part in a rally which was arranged by the National Partisans’ Organisation (ANPI) under the slogan “Fascism Never Again”. At the same time in the city, a protest led by the left-wing union group Cobas marched against the labour reforms known as the Jobs Act. The reforms were a signature policy of Mr Renzi’s government. Meanwhile, consecutive marches in Palermo in northern Sicily are expected to be attended by Roberto Fiore, the head of the far-right group Forza Nuova, and members of a far-left movement. Soumya Sekhar and Reema Sahu got married on the 18 February and they received the “gift” at their wedding reception a few days later. The employers of a Filipina maid found dead in a freezer in Kuwait have been arrested in the Syrian capital Damascus after a manhunt lasting several weeks. Joanna Demafelis, 29, was found frozen in her employers’ apartment more than a year after she was reported missing. Both Nader Essam Assaf and his Syrian wife Mona are being held on suspicion of murder, officials said on Saturday. Mr Assaf, who is a Lebanese national, was transferred to Beirut but his wife remains in custody in Damascus. On Saturday, a Lebanese judicial official said the couple had left Kuwait and made a “very brief stopover” in Lebanon before travelling on the neighbouring Syria. “Lebanon has asked Kuwait to pass on [Mr Assaf’s] police record,” the official added. Ms Demafelis’s death prompted outrage in the Philippines and a ban on Filipinos travelling to work in Kuwait. Both suspects became the subject of an international manhunt aided by Interpol. Philippines foreign secretary Alan Peter Cayetano welcomed the news of the arrests, calling it a “critical first step in our quest for justice for Joanna”. The maid’s body was found this month with apparent signs of torture, Philippine officials said, in an apartment that had apparently been abandoned for at least a year. In the aftermath of the discovery, Philippine authorities say they facilitated the return of more than 1,000 “distressed overseas Filipino workers” in Kuwait, most of whom had worked as household servants. The country’s department of foreign affairs estimate that some 252,000 of its citizens are living and working there. A wave of attacks across Afghanistan has left more than 25 people dead, most of them soldiers, officials say. In the worst incident, Taliban militants stormed an army post in the western province of Farah, killing 22 soldiers. A suicide attack in the capital Kabul left at least three security officers dead. There has been a surge in militant attacks in recent months and the army is often targeted. Some analysts see it as a response to a new, more aggressive strategy announced by US President Donald Trump last year, which committed the US army to an open-ended conflict, with the focus on “killing terrorists”. Early on Saturday, Taliban forces mounted an overnight attack on a base in Farah. Weapons were seized and the Afghan military said the Taliban had incurred a “lot of casualties”. In Kabul, a suicide bomber detonated his explosives in an area dotted with key diplomatic buildings. “I was driving nearby when I heard a big explosion, the windows of my car were smashed. I saw several wounded people on the street near me,” a witness told Afghan channel Tolonews TV. Jihadist group Islamic State said it carried out the attack, Reuters reported. There were further suicide attacks in Helmand province in the south, leaving two army members dead, and others, including women and children, injured. The Taliban control large swathes of Afghanistan – but IS militants hold sway in a much smaller number of districts. 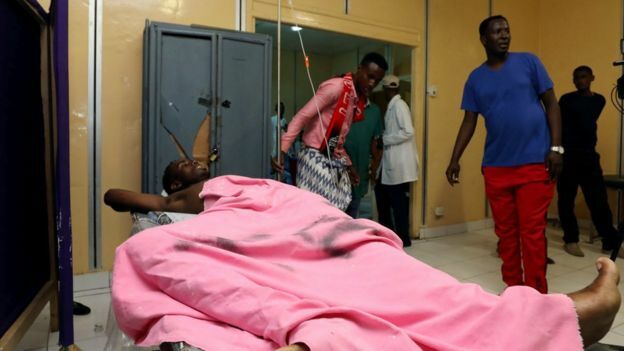 wo car-bomb attacks have killed at least 38 people in the Somali capital Mogadishu, officials say. The first took place outside the presidential palace late on Friday. The second hit a nearby hotel. Dozens of people were wounded. The Islamist militant group al-Shabab, which has been trying to oust Somalia’s government, says it was behind both. Last October, more than 500 people were killed by a truck bomb in the city. Officials blamed al-Shabab but the group never said it was behind that attack. The latest incident began when a vehicle failed to stop at a checkpoint outside the presidential palace before being blown up, state media say. This was followed by an exchange of fire between militants and security forces. Then a parked car exploded near the hotel. However, al-Shabab said it had targeted security forces. UK unemployment has increased slightly for the first time in two years. The rate of unemployment rose from 4.3% to 4.4% for the three months to the end of December, the Office for National Statistics said. Despite the slight increase in the unemployment rate, the total number of those in work increased by 88,000. Wages grew by an average of 2.5%, up from 2.4% the previous month, although the increase remained below inflation. The number of unemployed people rose by 46,000 to 1.47 million for the final quarter of the year, compared to the previous three months.